Want a way to really get in the Christmas Spirit? Make plans to participate in the Fill the Sleigh Ride! Three years ago our cycling friends in Franklin County invited us to join them for a toy drive/bike ride/poker run to benefit children in Franklin County. In addition to toys, they also take donations of new children’s books. These folks work hard to make this fun for all, and it is a joy to know you are helping a child have a good Christmas. They even have a drawing for prizes at the end of the ride and also a prize for best poker hand. (Riders get new cards at each stop.) Want to know more? Keep reading to find out how to be involved. Who: Anyone with a bicycle, helmet, & capable of riding 15 or 35 miles can join in on the fun! What: A poker run bicycle ride is set! We’re calling it “Fill the Sleigh Ride” as your entry fee is merely a toy with a value of $10 or more. If you bring a new, age appropriate book, you will have an extra chance at a prize. There will be several stops along the route for you to pick a card, and the cyclist with the best poker hand at the end of the ride will receive prizes and/or gift certificates! The pace will be mellow, so come out & have fun! Where: The starting location is Franklin County High School (FCHS) in Winchester, TN, and both the 15 mile and 35 mile routes will take you through scenic Franklin County. Why: There are many children in our county that will wake up on Christmas morning without a gift…we’re trying to limit that number. All toys and books will be donated to the NMS Toy Drive and will be available to families in need on December 16th. If you cannot ride that morning, you can still drop a gift by or ask someone to take it for you. Thanks to Maranda Wilkerson, Steve Garner, and others who host this wonderful event. 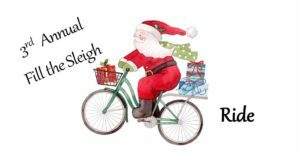 This entry was posted in Current Events, Ride Reports, The Right Side of the Road and tagged Bike Ride, Fill the Sleigh, Toys Books on December 3, 2017 by juliah.